THINGBEARD: Staring into the Abyss – Dork Forty! Clearly, some explanation is in order. Because, yes. That’s the Thing. Dressed like a pirate. 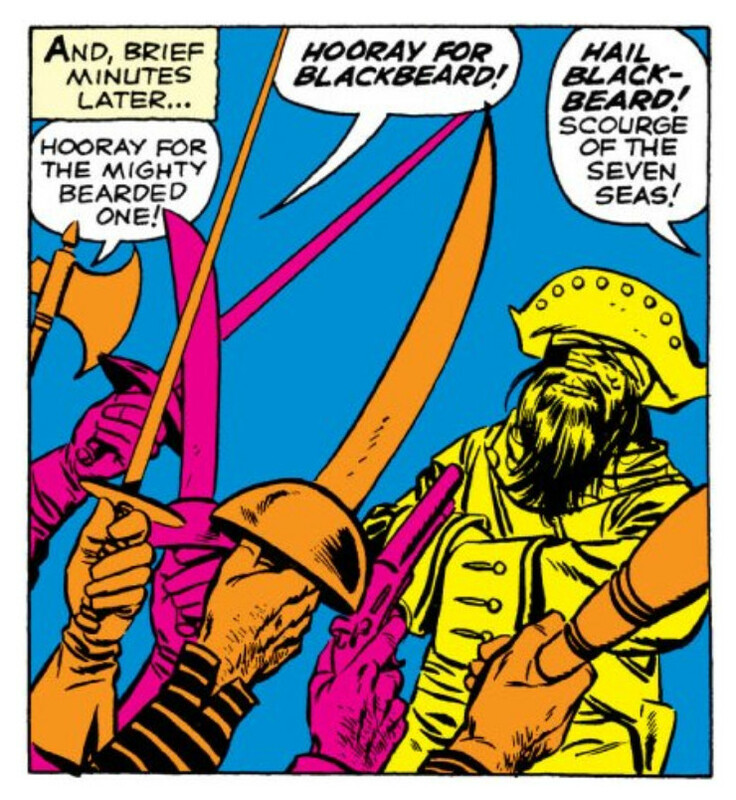 Declaring his intention to live in pirate times and be Blackbeard. A… humble moment to single out as the greatest in history, to say the least. But let me explain. Fantastic Four was the premiere Marvel comic. The flagship. It was their first super hero comic of the Silver Age, the foundation stone of an entertainment empire. And in its day, it truly was what it boldly claimed to be on every cover: The World’s Greatest Comic Magazine. 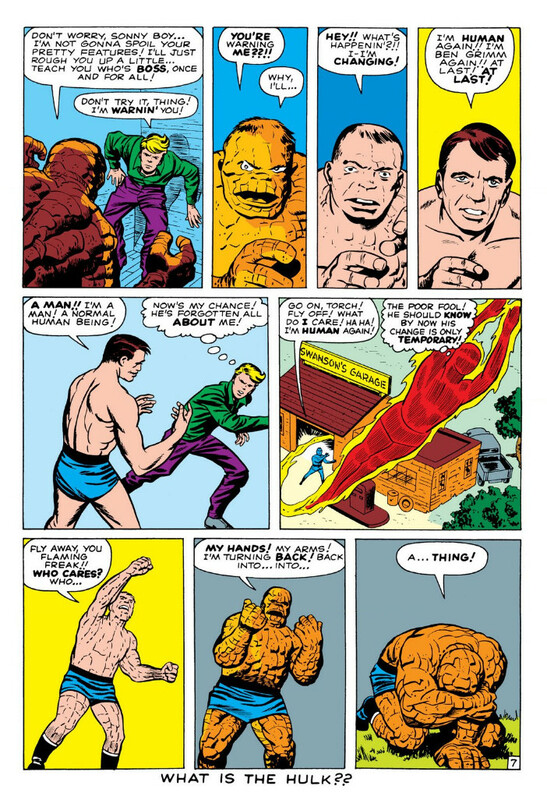 It had only just earned that status, in fact, the month before, in the pages of Fantastic Four #4. 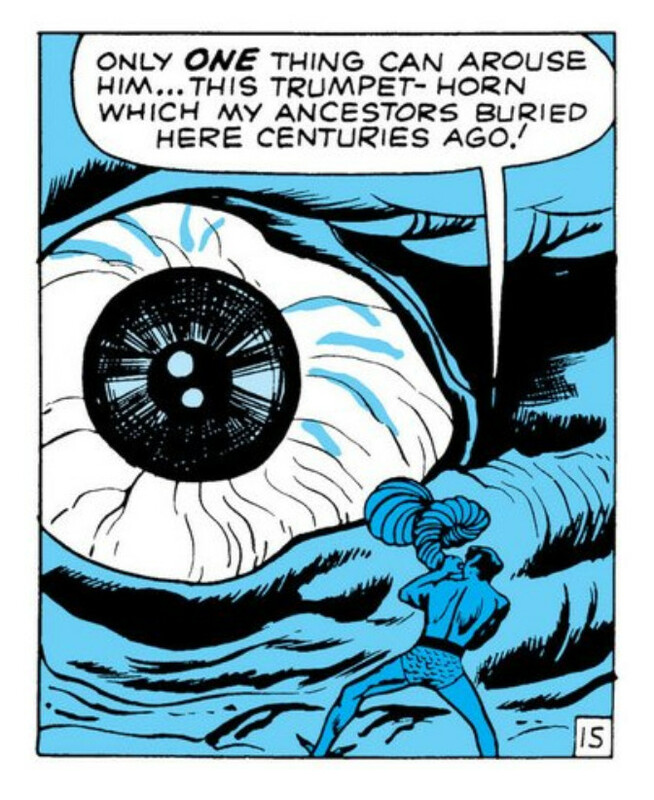 In that issue, Stan Lee and Jack Kirby resurrected Bill Everett’s Namor the Submariner, a Golden Age hero who’d fallen on hard times. 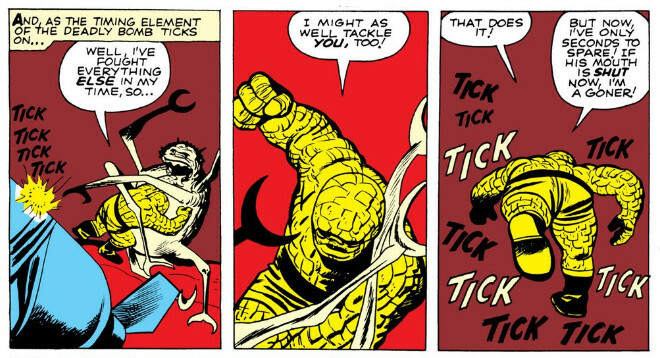 That comes close to being the Greatest Moment in Comics History itself, to be honest. 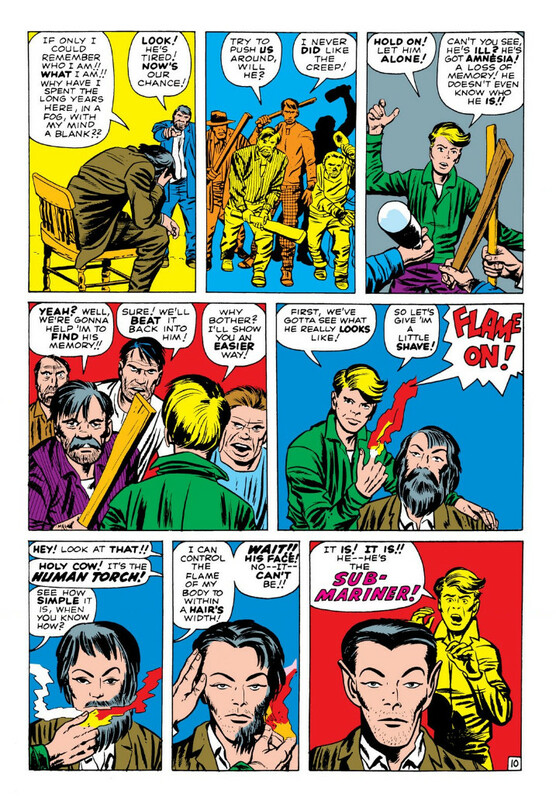 I mean… The Human Torch (himself a re-creation of Carl Burgos’ Golden Age android hero of the same name) finds the Submariner, crown prince of the lost city of Atlantis, living as a flop-house hobo. Which isn’t as good as a pirate, but it’s pretty close. 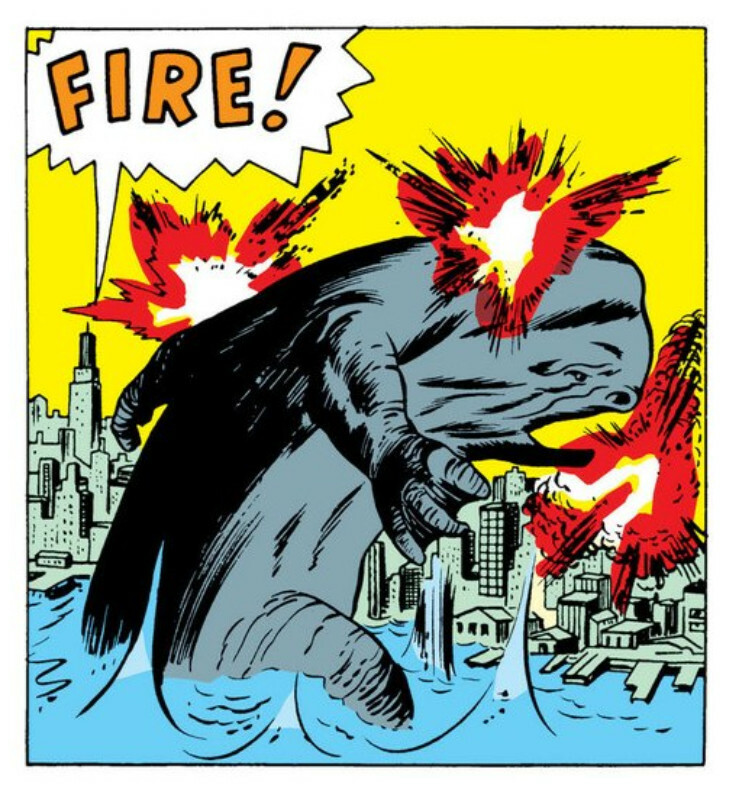 That’s GIGANTO, the monster Namor summons up to gain his revenge on the surface world for destroying Atlantis with underwater nuclear tests. And, yes. Giganto is a GIANT WHALE with ARMS AND LEGS! But that’s not the really awesome thing. 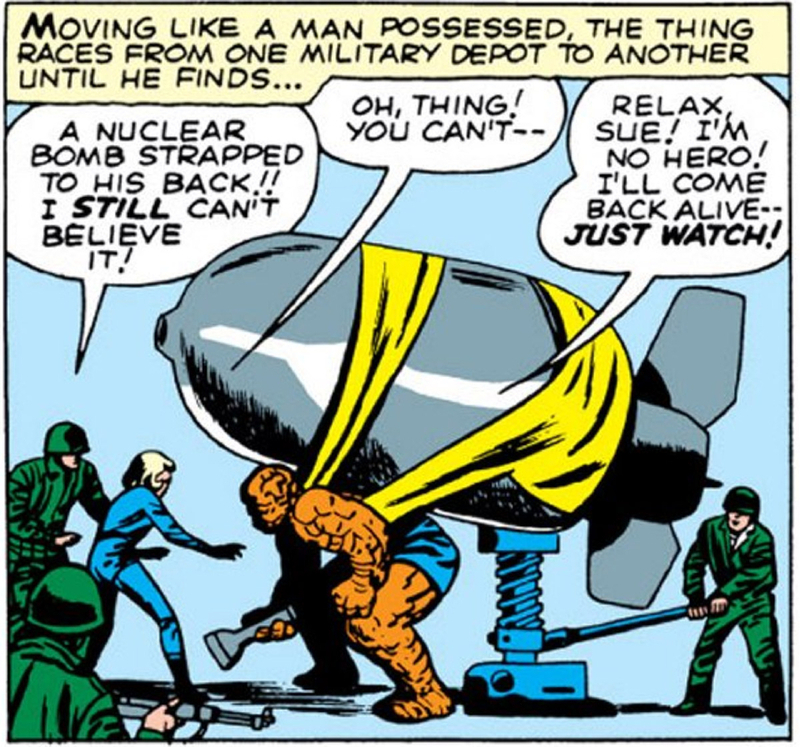 The really awesome thing is this: after Giganto beaches himself on the shores of Manhattan, the Thing decides that the best way to get rid of the monster is to walk down its gullet… WITH AN A-BOMB STRAPPED TO HIS BACK! And, once he’s in there, he encounters the… I dunno… giant sea lice or somethin’ …that live in Giganto’s guts, and fights one of them WHILE THE BOMB IS TICKING DOWN! Really, this is the standard… the measuring stick against which all super hero comics must be held. If your story isn’t WALKING WHALE AND A-BOMB crazy… if it doesn’t feature anything as awesome as a SUPER HOBO… It might still be a story worth telling… But you are NOT writing the World’s Greatest Comic Magazine! Granted, even Fantastic Four couldn’t pass that test every month. 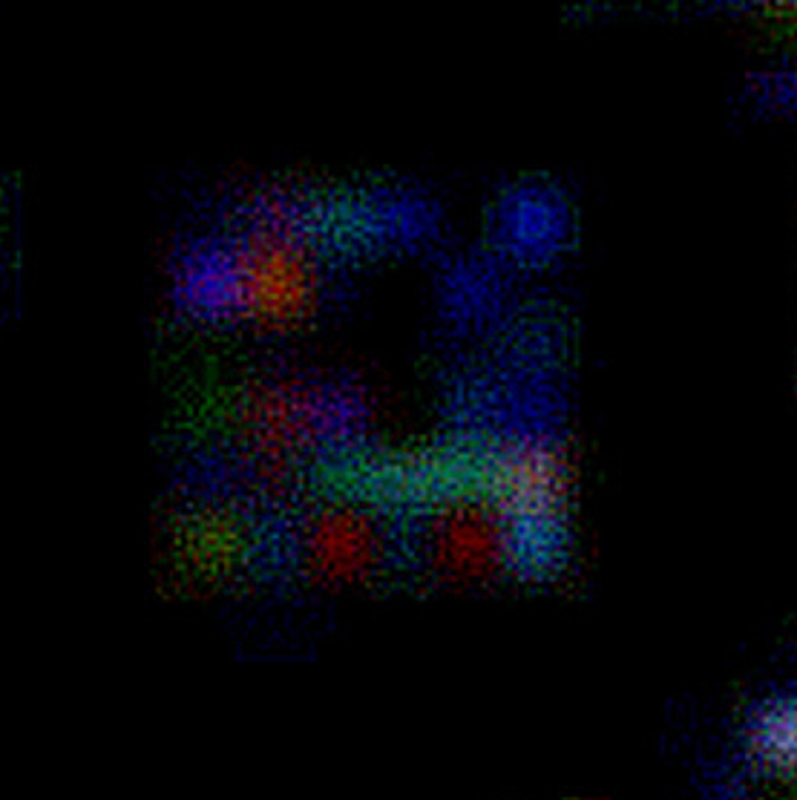 Issues four and five, in fact, represent the book’s early peak. 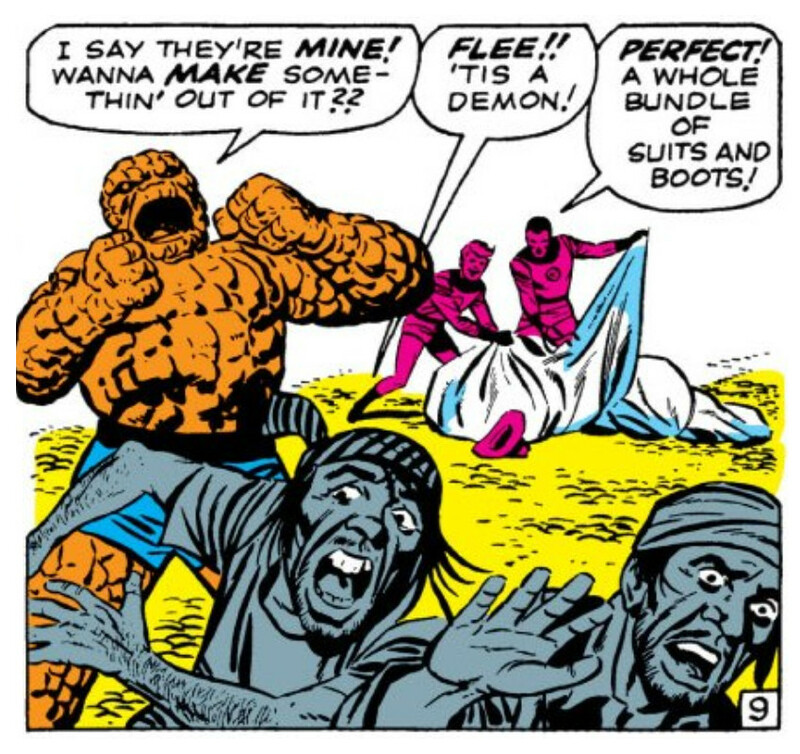 They’re the culmination of what Lee and Kirby had been trying to establish in the first issue. Or, more specifically, the origin story. Lee’s always said that FF was his attempt to do super heroes the way he wanted to see them done: regular people with flaws rather than beautiful Greek gods and paragons of virtue. 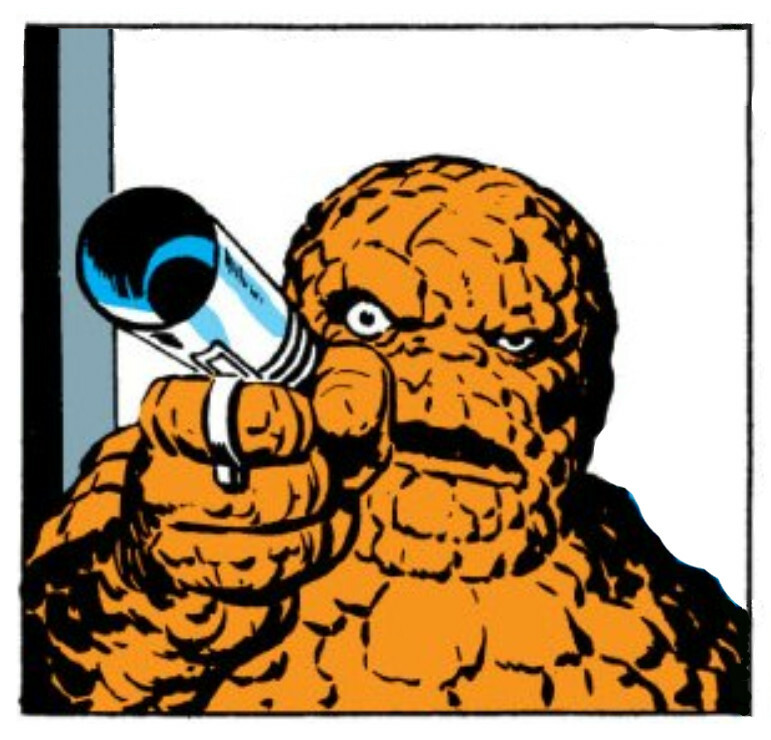 The execution of that concept was left largely up to Kirby; in his art, he plotted the stories out based on core concepts he and Lee discussed beforehand, and Lee came in afterwards to write dialogue that shaped events and brought the characters to life. That Kirby influence is obvious, however, even in the first issue. Because the FF origin owes quite a bit to his origin story for the strip he was doing when he came to Marvel to do monster comics: Challengers of the Unknown. In both strips, a group of people survives a crash landing that leads them into into a life of adventure. Some of the details are different, of course: here, Reed Richards and his crew do a test flight in a space rocket, but because of its insufficient shielding, they’re bombarded with Cosmic Rays that give them super powers. But the similarities are too strong to ignore, and considering Kirby’s acrimonious departure from the Challengers strip (he didn’t like paying his editor kickbacks), I can’t say as I blame him. Anyway. Beyond the Challengers connection, there’s a ton of crazy in the FF origin, too. The reason they take the rocket up without proper shields, for instance, is that Reed’s funding has been cut, and they actually have to STEAL THE ROCKET to make that test flight. And as long as Reed’s making questionable decisions, he also decides that it’s okay to take along not just his pilot, but his untrained girlfriend and her kid brother, too. Then there’s the initial manifestation of their super powers, which is really why I’m talking about the origin story at all. We take the Fantastic Four’s powers for granted these days. They’ve been around forever, and most of us grew up with them, so they don’t seem all that weird. But, really… Think about these guys for a minute. Seriously! Even if you get past the image of a man burning alive (which, you know, he ain’t screamin’ or nothin’), there’s still the issue of how INSANELY DANGEROUS this super power would be. 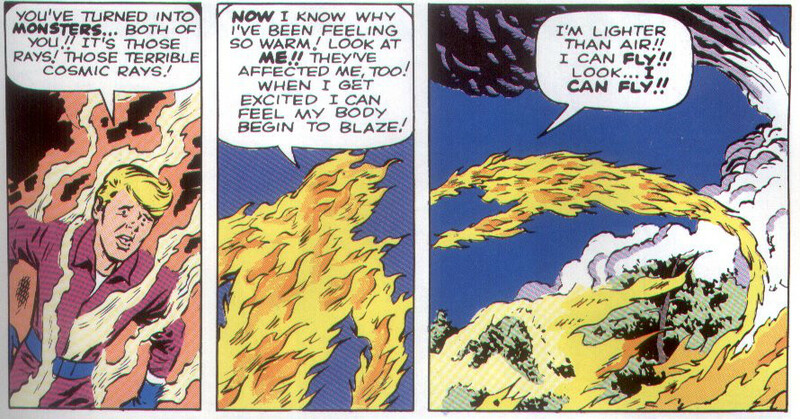 I mean, he’s called THE HUMAN TORCH, for god’s sake! He’s a walking, talking fire hazard! He’s even setting the trees on fire as flies past them! In comparison to, say, super strength, that’s a pretty freaky power. There’s just something weird about the way his body twists up below the shoulders like that, with his head still normally-formed above. That is, at least, a little bit freaky, and it adds to the sense of body horror three of the four FF members invoke. Even Sue Storm, the Invisible Girl, has a touch of it, though. Her invisibility powers represent a desire to vanish, to not be seen, and that probably says something about body image that is indeed rather horrible. He’s a lump. 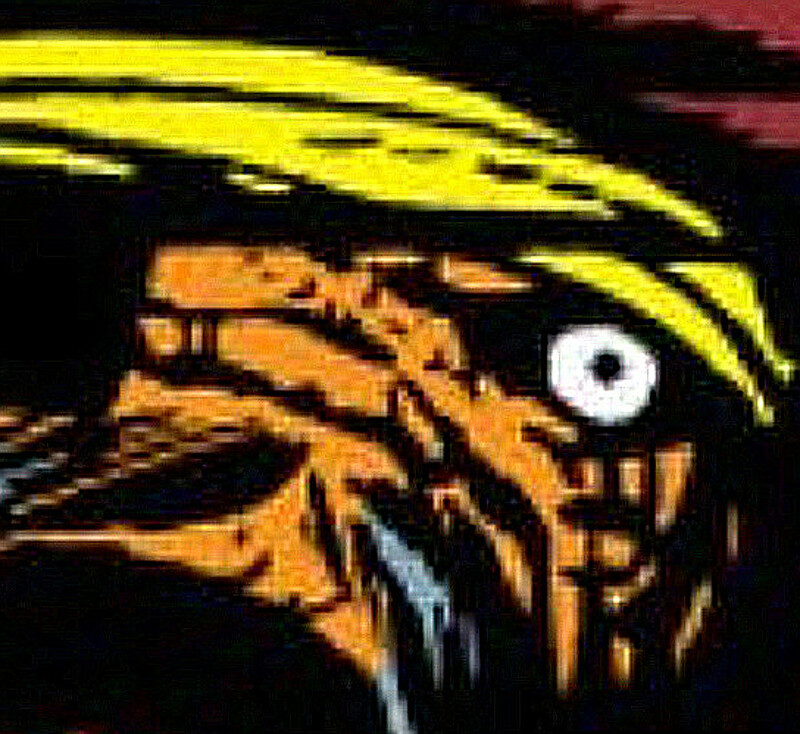 A mound of leathery orange so misshapen that sometimes it looks like he’s melting. And he doesn’t get any prettier over the course of the first few issues, either. And he’s got a demeanor to match. Ben is ostensibly a hero; despite his protests, it’s hard to call his A-Bomb stunt anything but an act of heroism. But he’s also bitter and angry, consumed with resentment over his condition, and impossible to get along with. click to embiggen the feels! Why doesn’t Doom go himself? Well, SOMEbody’s got to stay behind and operate the time machine! I love this particular motivation, by the way. Some have said it’s just an excuse for raw cowardice, but I disagree. I think that Doom’s megalomania has made him so very alone in the world that there’s literally no one he can trust to do it. No one he can count on to send him back in time … and also bring him back. 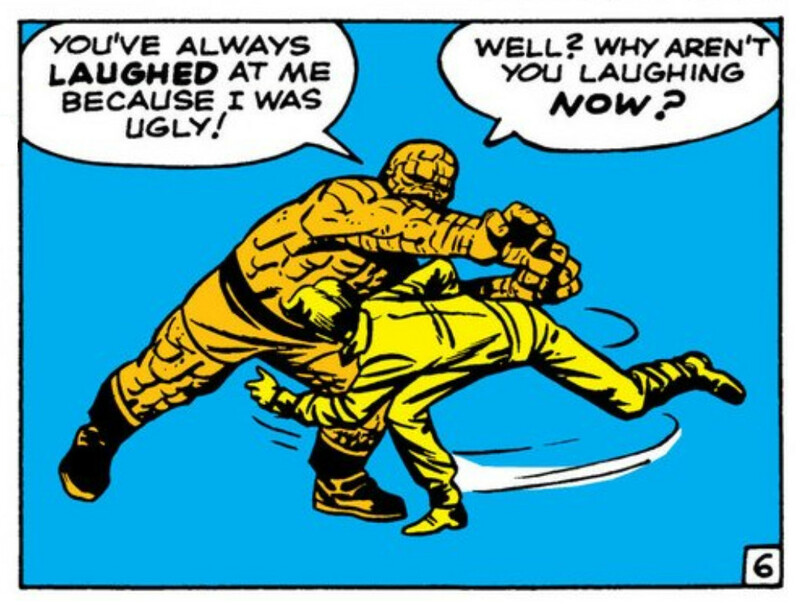 I have no idea if that’s what Lee & Kirby intended at the time (though I suspect that, for Kirby, the cowardice motive was probably more what he had in mind). But in light of the character’s later appearances, I still prefer my reading. It fits, and speaks to the tragedy of Doom. …and promptly get themselves shanghaied, the victims of spiked drinks at the local tavern. And here’s where it gets interesting. When they come to, they of course mop the decks with the pirate crew. But then a rival vessel attacks, and the pirates rally behind the Thing to not only repel the attack, but take over the other ship. 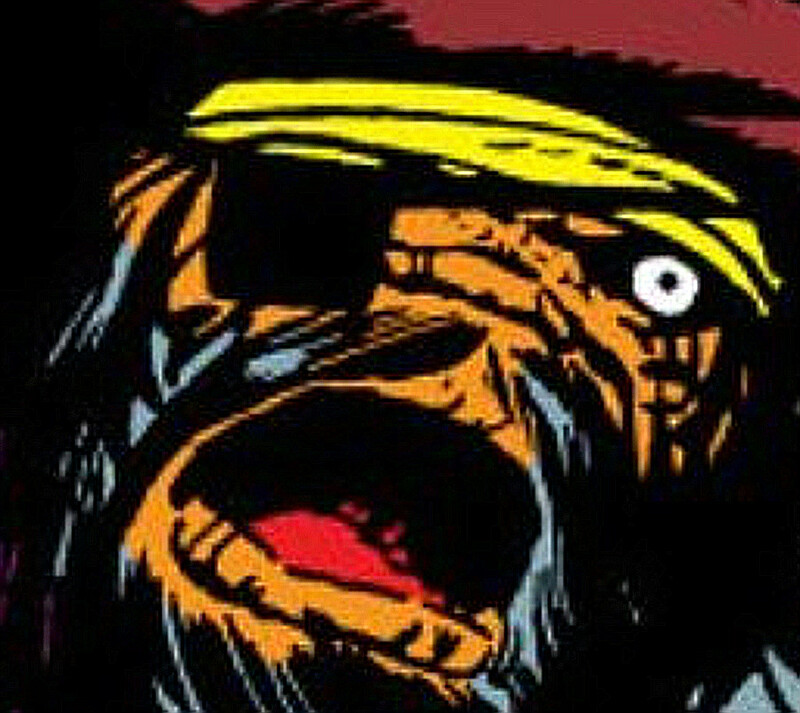 The raid is a rousing success, and the pirates welcome the Thing as their new captain. But, you know, bizarre as this moment is, it doesn’t seem as strange when you read through all five issues. Ben’s been building up to something like this. Getting angrier and angrier, more and more irrational, all the time. 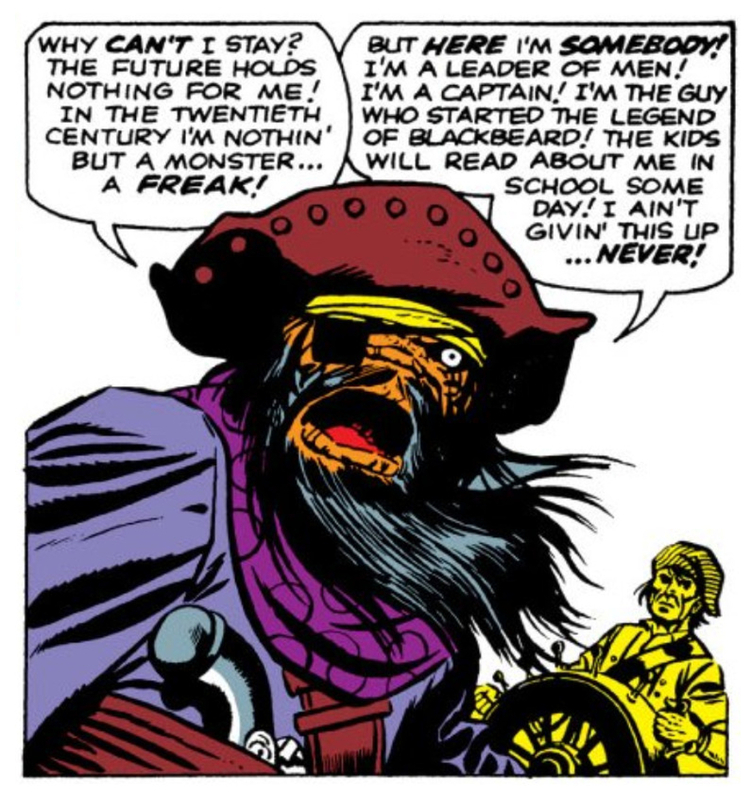 Especially after that heartbreaking transformation back to human in issue four, his decision to BE BLACKBEARD comes off less as a WTF moment and more like an inevitable mental breakdown. 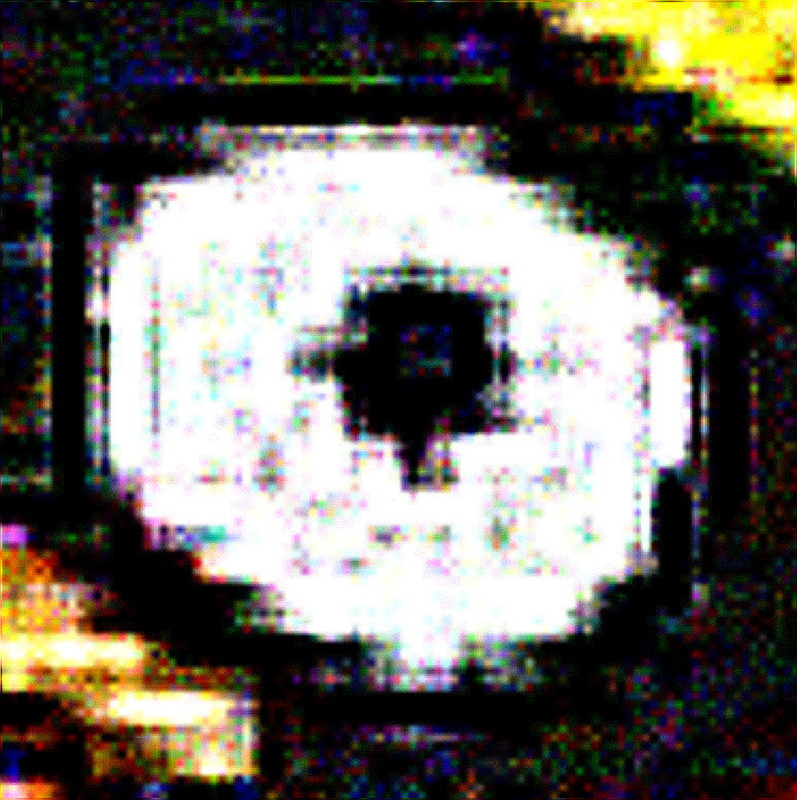 And, thanks to that one exposed eye, you can see it on his face. I mean, just LOOK at the guy! But be careful! 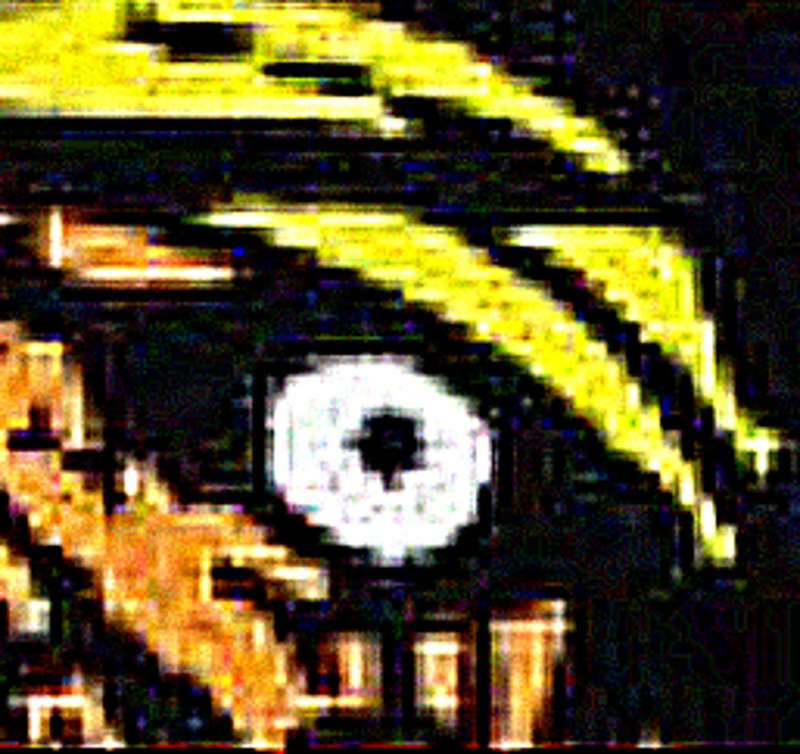 To stare into the face of Thingbeard is to stare into the abyss. This isn’t just the culmination of Ben’s story arc over these early issues, either. I mean, it is that; he says himself just a couple of pages later that he lost his head, and in two issues’ time he’ll have fallen in love with the blind sculptor Alicia Masters. From there, he never really looks back on his early days as the heroic heel. Life gets nicer for him, and he gets nicer in return. 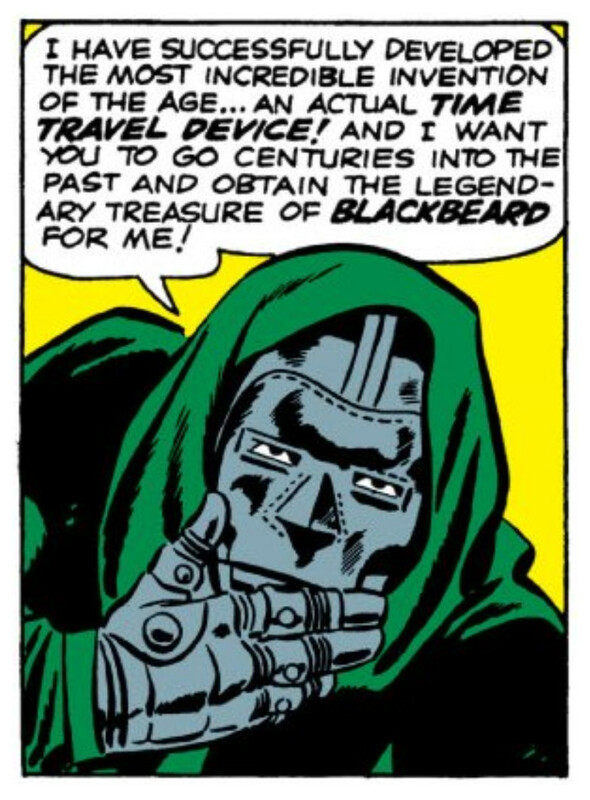 But Thingbeard represents something else, too. It crystallizes, early on, the whole point of the Thing, and maybe of the Marvel Comics hero in general: becoming a super hero doesn’t make your life perfect. In fact, it probably ruins it in a lot of ways. Ruins it so badly that you’d rather be a lousy pirate. 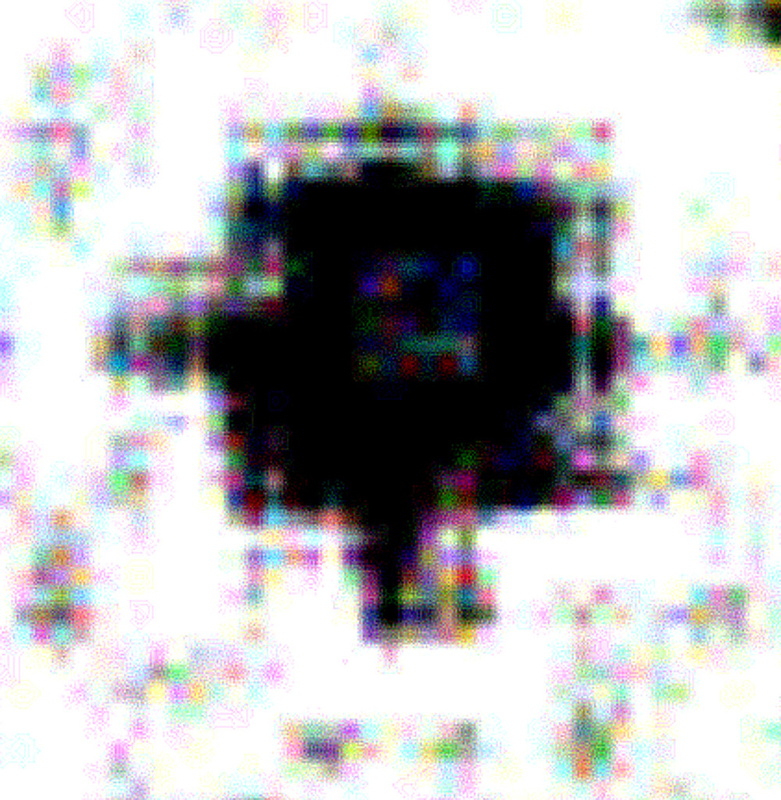 You’d rather live in the past and, if you have half a chance, BE BLACKBEARD. Admittedly, it’s a lot to take in when you’re a kid. 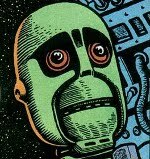 I first read this story (in reprints) when I was probably seven years old, and it blew me away. 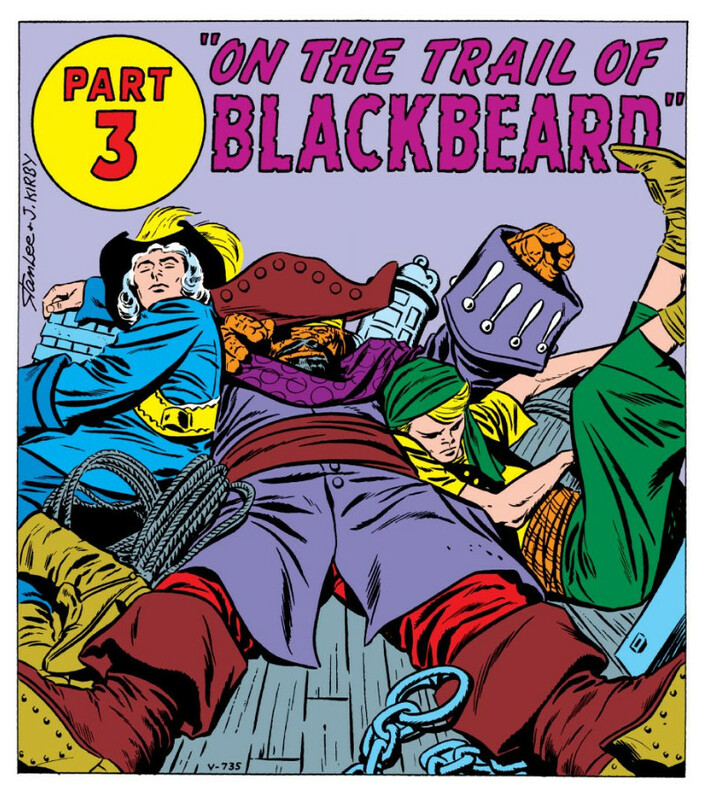 I didn’t recognize the ridiculousness of it, of course (“Blackbeard? Makes sense to me!”). But that look on the Thing’s face stayed with me. And so did the lesson it taught. That, in particular, laid the groundwork for so much that came after it. So when I saw Spider-Man chuck his costume in a garbage can, I understood why. And when Moon Knight went crazy from his multiple personalities, I could see how that might happen. And when Alan Moore taught the Swamp Thing (another monster) that it was really just a plant that thought it was a man… It felt like coming home. Because I am of the generation that grew up as comics did. Every time I got ready for something more complex and more adult, somebody in comics pushed the envelope and delivered it for me. Not always to good ends, of course. But for the most part, I’m pleased with the results. And the thing that set me up for all that, the thing that got my mind right for it, all the way back at the beginning… was Thingbeard. 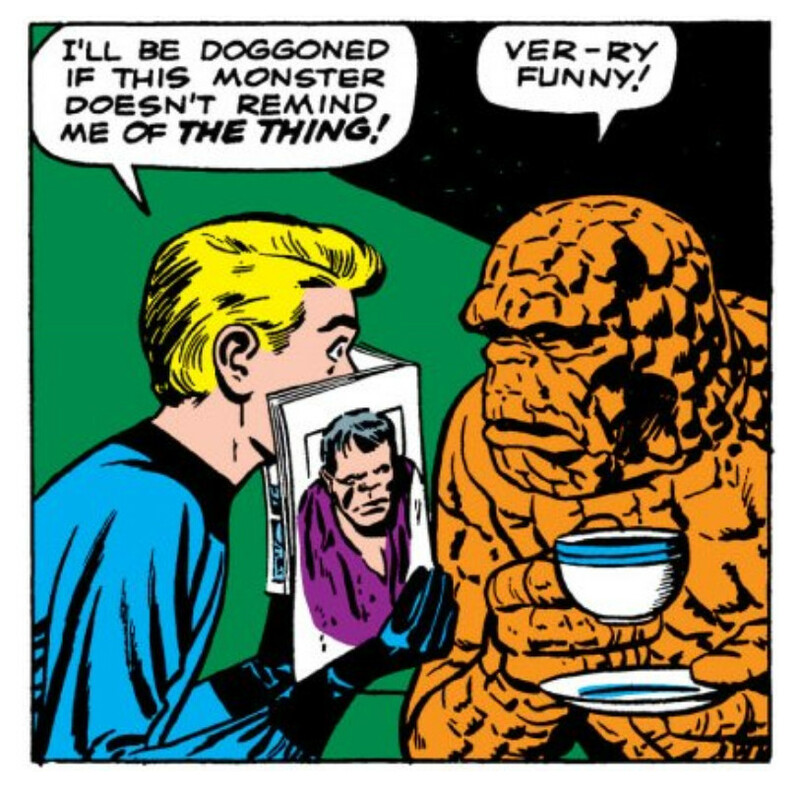 Fantastic Four Remix – Dork Forty!